In 1994, the United Nations General Assembly declared June 17 the World Day to Combat Desertification and Drought to promote public awareness of the issue, and the implementation of the United Nations Convention to Combat Desertification (UNCCD) in those countries experiencing serious drought and/or desertification. 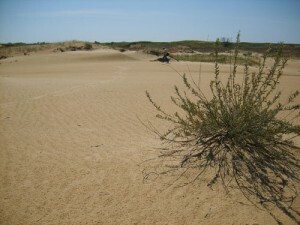 Desertification is also serious and long-lasting problem for Ukraine, which is member of the Convention. [There is the Law of Ukraine on membersip i.e. ‘Про приєднання України до Конвенції Організації Об’єднаних Націй про боротьбу з опустелюванням у тих країнах, що потерпають від серйозної посухи та/або опустелювання, особливо в Африці (Відомості Верховної Ради (ВВР), 2002, N 36, ст.267 )]. The country already has deserts and ‘techogenic deserts’ on its territory. Climate change and some local poor land management aggravates respectively the problem. In accordance with modern modelling results (GLM) has been presented by BioModel some wood species like Pedunculate Oak (Quercus robur) would show that the steppe natural zone will became unsuitable partly for changeling habitats of the species (Pedunculate Oak GLM description). See more BioModel scenarios on expected habitat changes in steppe zone by 2050 with usage of the site-map or our publications.